Anthony Ryan's debut novel Blood Song - book one of the Raven's Shadow series - took the fantasy world by storm. The sequels, Tower Lord and Queen of Fire were both New York Times bestsellers. 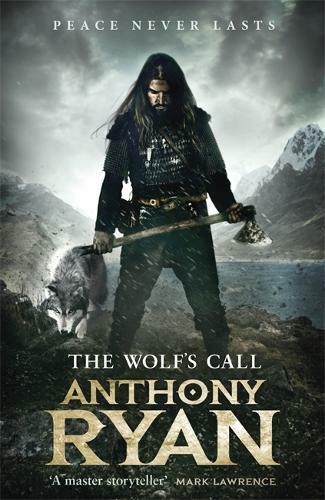 Now, Anthony Ryan returns to the world of this acclaimed fantasy series with The Wolf's Call, which begins a thrilling new story of razor-sharp action and epic adventure. Vaelin Al Sorna is a living legend. It was his leadership that overthrew empires, his blade that won hard-fought battles, and his sacrifice that saved the Unified Realm from destruction. Yet Vaelin has turned his back on prestige and glory to live a quiet life in the Realm's northern reaches. But now whispers have come across the sea of an army called the Steel Horde, let by a man who believes himself a god. Vaelin has no desire to fight another war, but when he learns that Sherin, the woman he lost long ago, has fallen into the Horde's grasp, he resolves to confront this powerful new threat. To do so, Vaelin travels to the realms of the Merchant Kings, a land ruled by honour and intrigue. And as the drums of war echo across kingdoms riven by conflict, Vaelin learns that there are some battles even he cannot hope to win.